There have been many questions on the subject of feeding young children cow’s milk long past the age when they would normally stop drinking their own mother’s breast milk. Not surprisingly, a study was released this past week linking cow’s milk to early menstruation in young girls. Drinking fairly large quantities of the beverage over long periods increases the chance for girls to reach menstruation at a younger age than they would normally. This is not all that remarkable if you consider that it is an unnatural act to drink a substance that is designed for an altogether different species. The bovine (cattle) genus is poles apart from the human being. Calves have exceptionally different developmental patterns than humans; they grow to an enormous size and in a very short period of time. Many people have also questioned the routine of giving additional bovine growth hormones to dairy cattle. This practice has led a number of parents to purchase more costly, organic milk for their children. 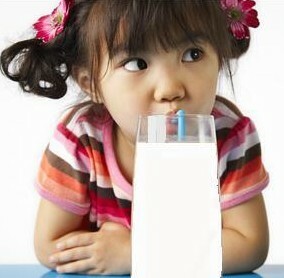 However, it seems that any kind of cow’s milk has an impact on the physical development of young girls. Additionally, IGF-I, a naturally occurring growth hormone common to both bovines and humans, is associated with accelerated development rates for puberty and height. Both drinking cow’s milk and eating meat from animals are known to advance the circulating amounts of IGF-I throughout the system. Therefore, not only is drinking cow’s milk a drawback, combining it with a meaty diet only exacerbates the problem. My daughter (vegan since age 5) got her period at age 14.5 instead of 12 like most of her friends. She loves soy foods, soy milk, etc. So it appears that phytoestrogens [found in soy products] have not had a negative effect. Hi, thank you for this post. You may wish to elaborate in another post about the health consequences of early menstruation (before age 12), namely that it is associated with an elevation in [lifetime] risk for breast cancer, apparently a result of greater exposure to estrogen. Of course, it is one of several such concerns and it is the constellation of risk factors that must be taken into account. Early menstruation also is associated with increased risk of certain other chronic diseases, including cardiovascular disease and diabetes. It is not clear whether early menarche is an independent risk factor or whether the risk is tied to higher levels of accompanying obesity. In any event, earlier menstruation in the population is cause for concern.